– Some seriously misguided people on the Internet is saying that the recently announced GFI figures on illicit outflows is proof that our govt money is all being stolen away and transferred overseas. – Please look at the figures in the picture. 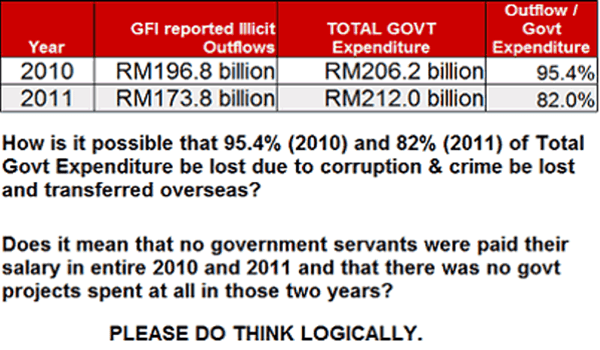 How is it possible that 95.4% (2010) and 82% (2011) of Entire Total Govt Expenditure for those years be lost due to corruption & crime and transferred overseas? Does it mean that no government servants were paid their salary in entire 2010 and 2011 and that there was no govt projects spent at all in those two years? It is NOT govt’s money that is being stolen and transferred overseas. – Basically, how GFI came out with the figures is just to look at the trade differences between Malaysia and our trading partners and noting the discrepancies. So simplistic! – trade mispricing happens when companies and highly paid professionals try to book profits in countries with very low tax compared to Malaysia to avoid paying tax in Malaysia. – Malaysia corporate and personal tax is 26% and Singapore’s taxes are 17%. -That is why we NEED to have GST implemented straight-away and reduce our Malaysia’s personal and income tax in order to stop this problem of illicit outflows due to trade mispricing.